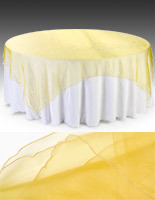 This Economical Table Skirt with Stylish Design Fully Covers a Table! Buying a Package Ensures that Each Component's Color is an Exact Match! Project Professionalism with a Decorative Table Skirt! Table topper, skirt, and clips provide complete presentation. 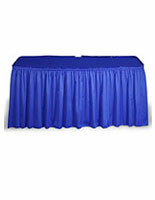 Table skirting is sized for use with 8' tables. Fire retardant polyester fabric is extra durable. 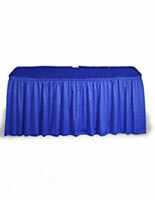 This table skirt is normally used at restaurants, trade shows, conventions, and hotels to create appealing displays. 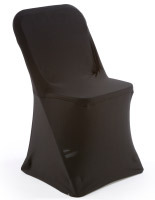 The unit features 100% polyester fabric that has been dyed red to provide a striking color. 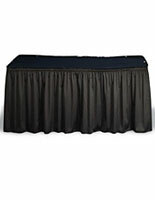 The table skirt fabric is machine washable and dryable to be easily cleaned. A tablecloth has been designed for use with 8' x 30" tables. 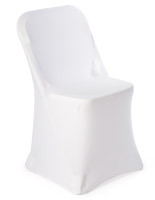 When used with this size, the table skirt fits all the way around with no problem. The fabric falls to just 1" above the ground on all sides. 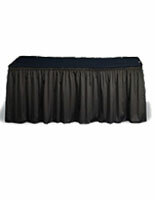 Table skirt, also known as a throw or linen, includes a table topper, skirting, and table clips. These clips can be used with tables that are 3/4"- 1-3/4" thick, and are not designed for any other sized edges. 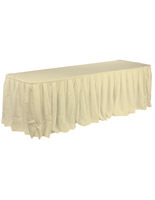 This table topper is 9' x 42" to fit on your table easily and fill the table completely. The table skirt is flame retardant and is even shipped with a flame retardant certificate from an independent testing laboratory. Buy a tablecloth and drape set for you business today to present a professional appearance that is sure to help garner the attention of customers.